You Can Now STREAM the Digital Version or ORDER the DVD/Blu-ray of the Film Today! Watch the official film trailer below to learn more. 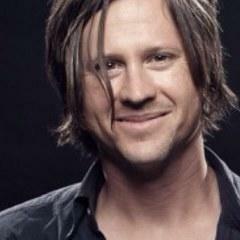 Want to Watch the First Full 10 Minutes of I'll Push You for FREE? We would LOVE for you to watch the first ten minutes of our award-winning film for FREE! Just click the button below to start watching right now! Order The Award-Winning Film Today! 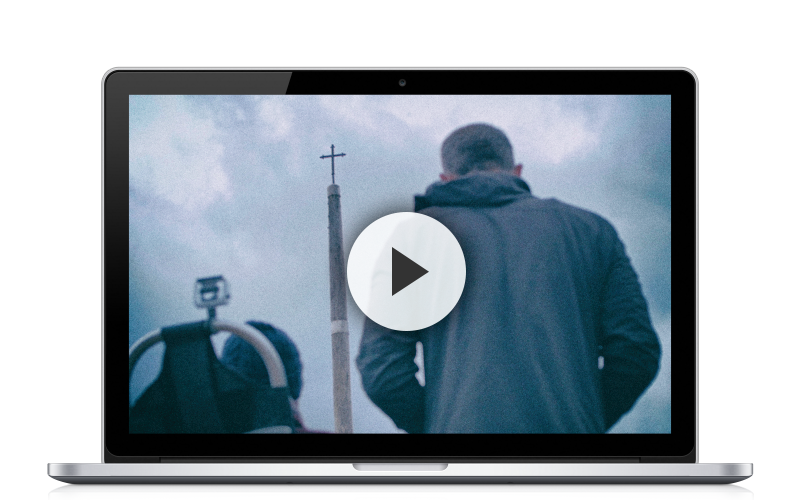 You can now watch this incredible, heartfelt, award-winning journey of faith, love, community, and friendship. Order the Special Edition Blu-ray which contains two discs: The feature film and another disc with previously unreleased scenes, interviews, and bonus footage. PLUS, a special private website with even MORE stuff! 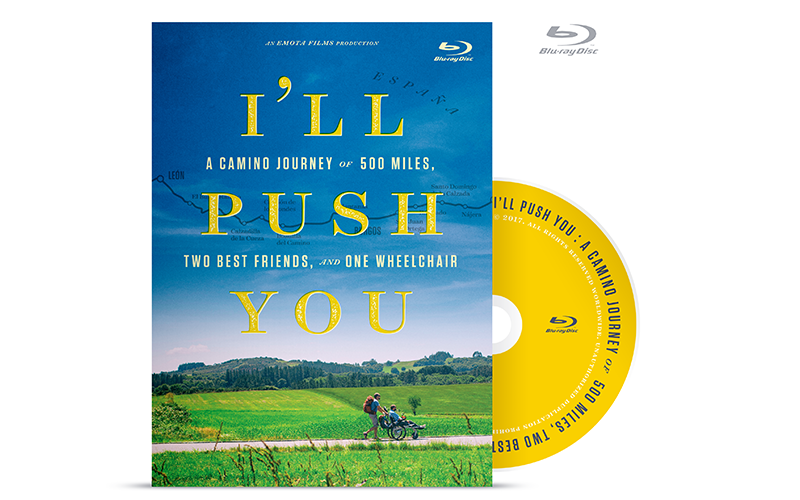 Order the Blu-ray (High Definition) version of I'll Push You which contains the feature film along with the pre-roll content and Q&A with Billy Gilman from the theatrical release, and previously unreleased footage. 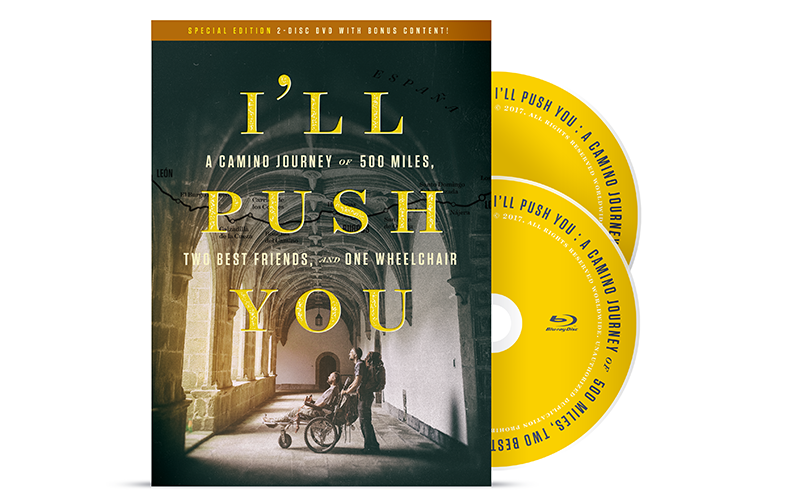 Order the DVD (Standard Definition) version of I'll Push You which contains the feature film along with the pre-roll content and Q&A with Billy Gilman from the theatrical release, and previously unreleased footage. 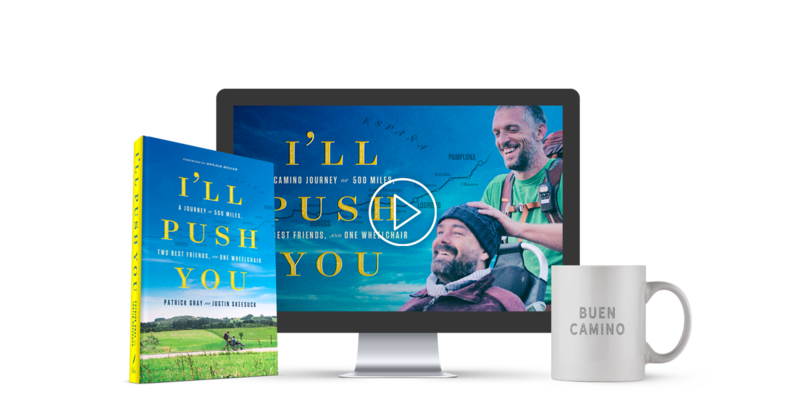 Order the Streaming (High Definition) version of I'll Push You which contains the feature film along with the pre-roll content and Q&A with Billy Gilman from the theatrical release, and previously unreleased footage. Here are some other places where you can also get "I'll Push You". Interested in Licensing “I'll Push You” for Your School, Library or Organization? If you're part of a nonprofit, business, or educational institution, we've created I'll Push You Screening Kits and Site Licenses to give you an easy-to-use resource for showing the film and leading discussions about the issues that are important to your organization. In case you didn't know, we also have a book! We've had an amazing response to our memoir. If you'd like to read the first three chapters for FREE, to "try before you buy", then fill in your first name and email address. 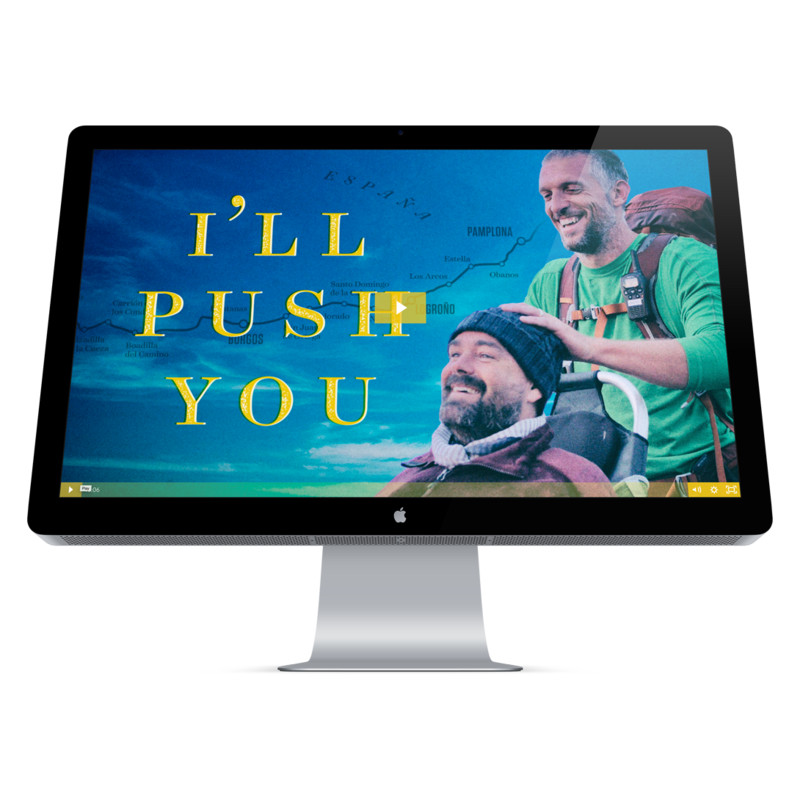 "I'll Push You is not just the remarkable story of one able bodied man pushing another man's wheelchair on a 500 mile journey. It's the story of two friends who've spent their entire life's journey pushing each other to be better people. Through their courage, grace and dignity, Justin and Patrick remind us that we are stronger together than separate. As it turns out, we all need a push." 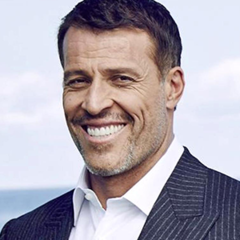 "We live in a world where it is hard to ask for help, and often we miss out on an opportunity to feel connected, to feel alive by helping others. It is amazing what we can learn about ourselves by being a support for others. “I’ll Push You” is a very moving film that will touch you in many ways. As one of the songs from the film says, “‘life is short, live it well.” Could not say it better myself. Don’t miss this film!" "This is an incredibly inspiring film of friendship and faith. Go see it!" 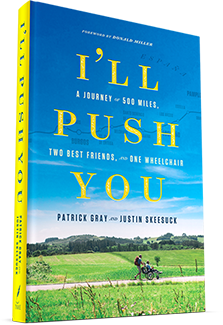 "In our fast-paced world of shallow engagement, "I'll Push You" comes as a breath of fresh air, depicting a brotherly friendship that is refreshingly deep and authentic. Disarmingly vulnerable, and dangerously challenging, Patrick and Justin offer us a glimpse of what true friendship can look like if we are willing to take the risks." "You’re guaranteed to fall in love with the world again, as the common good and love in humanity shines bright ad infinitum through Justin, Patrick, and their relationship to each other and those around them." © 2019 Push Inc. & Emota Inc. Wait! Before you leave, would you like to watch the first ten minutes of "I'll Push You" for free? Would you like to "try before you buy?" We totally get it and would like to have you check out the first full ten minutes of our film. Just click the button below to get started! Watch the First Full 10 Minutes of I'll Push You for FREE! But first, could we get a little bit more information about you so we can best serve you moving forward? Note: Your privacy is important to us and we will not spam you. Ever.